Iran’s Intelligence Ministry pressed charges against activist Parastou Forouhar based on a photo of one of her artworks that created a stir on social media, she told the Center for Human Rights in Iran (CHRI) on November 13, 2017. 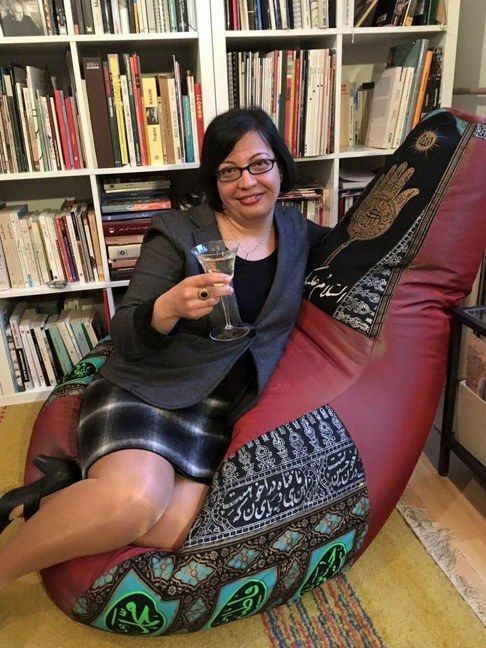 Forouhar was referring to a photo posted online in May 2016 showing human rights lawyer Shadi Sadr holding a glass of wine and sitting on one of Forouhar’s artistic creations: a beanbag made of fabric with Arabic script pertaining to Shia Islam. Muslims are forbidden from consuming alcohol or desecrating Islamic script. In Iran, people can be prosecuted for these actions. “After this photo was posted on the Internet, there was a wave of insults and accusations against me on social media and that’s when the Intelligence Ministry accused me of [the charge of] ‘insulting the sacred’ and took me to court,” said Forouhar. Forouhar said the Intelligence Ministry has been trying to intimidate her to prevent her from holding memorials for her parents in Tehran. “[The Intelligence Ministry] also complained that every time I return to Iran to hold an event, others take advantage of it,” she said. Forouhar noted the irony of the Intelligence Ministry filing charges against her around the same time President Hassan Rouhani signed the Charter on Citizens’ Rights—widely touted by his government—in December 2016. Forouhar said the Rouhani government had devised new ways to ban the commemoration ceremonies for her parents without leaving a footprint. Asked about the status of her quest for justice for her parents, Forouhar said former Intelligence Minister Ghorbanali Dorri-Najafabadi has not been charged for his role in their murder and the civil suit she wanted to file against him never made it to court.